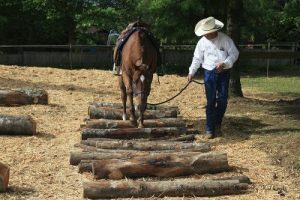 A scramble is an obstacle designed to teach the horse how to walk through a set of small rolling logs that move. This obstacle is a result of a real trail situation where I was riding near Mount St. Helens in Washington State on a trail slightly overgrown with grass. In the grass was hidden many small four and six inch logs. It was impossible for the horses to not step on the logs as they went down the trail. My horse is a seasoned trail horse and did fine. However, several other horses on the ride were very upset and were unable to deal with it in a safe manner. All but one rider made it through and remained in the saddle. Other than bumps and bruises, the dislodged rider was okay minus a bruised ego. That particular incident stuck in my mind, along with several others where there had been recent logging and the horses were forced to walk through wood debris. It seemed the horses were very uncertain what to do in these situations resulting in nervous riders who made the horses even more uncertain. In order to get through the debris riders became more forceful in their cues and in the end the joy of the ride was gone with only the drama of a very unsafe situation remembered. To prevent this situation, and to teach the horse and rider skills that will lead to a safe ride through adverse scenarios often encountered on the trail, one only needs to set up a scramble. Like many obstacles this can be a great tool if properly taught, or dangerous if improperly taught. Safety to the horse and rider is the first priority and the way to accomplish this is to have a bold, confident horse that has been trained to deal with possible trail challenges. Before you start training for the scramble, make sure that you have a strong Bolender Bubble and the horse is locked into you so it will start and stop with you without pulling on the halter. It is critical that you have the ability to inspire the horse to think its way through so it will not bolt or rush through. Start by presenting the obstacle and allow the horse to inspect it. DO NOT force it through. Allow it to take steps into the obstacle and even walk out if it wants to, but put it right back in. Your Bolender Bubble must be well established for you do not want the horse coming out on top of you. Make sure that you allow the horse all the time it needs to think its way through and that it is willing to stop on command. Do not worry if the horse wants out and/or comes out of the scramble. Continue on until the horse is comfortable walking through from end to end. When the horse is comfortable it is time to mount up and ride. Take your time and trust the horse; when the logs roll the rider often tenses up and this causes the horse to tense up. At first it will feel funny as the horse works to keep its footing, but fear not. The horse’s instinct will guide it to proper foot placement without rider interference. Keep both legs on softly and use very light supporting reins. A light contact will give the horse support and encouragement while allowing it to lower its head and hunt the trail. More than likely the horse will come out of the scramble at first without being asked. Simply direct it to go back in while showing no emotion. Within a short time, the horse will be walking and picking its way through the scramble in a safe manner. To create your own scramble you will need approximately 40 small logs of various sizes in diameters. I like them to range from two inches to six inches across and all be approximately six feet in length. Lay the logs in a straight line with very few gaps between them. I like to use Douglas fir, ash or oak. I don’t like to use alder or maple because they dry out and break too easily. The other types are very tough and last much longer. Have fun and be safe!